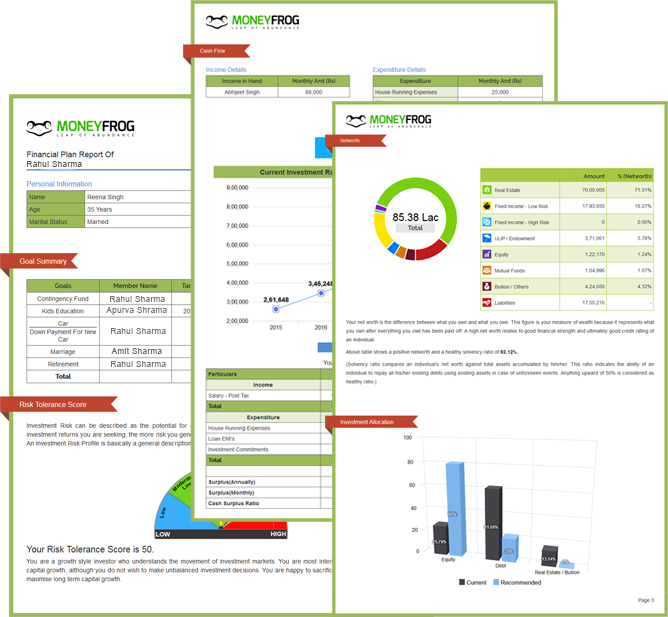 Moneyfrog Dashboard gives an insight on your Investments, Finances & Goal tracking through Innovative online dynamic Analytic Tools & Smart Graphics. Our analytical tools help you make decisions with EASE. 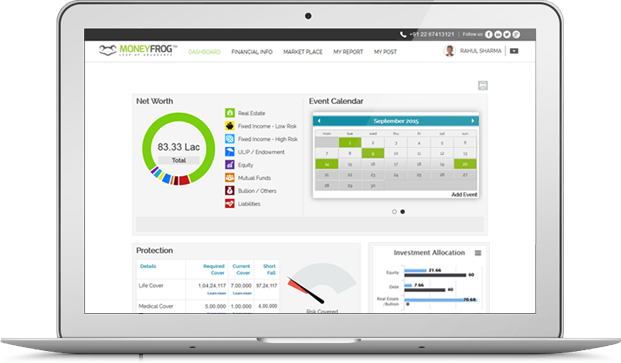 Goal Tracker is Moneyfrog’s Revolutionary Proprietary Tool, designed & developed IN-house, to map & track Investments, based on risk, profile & tenure. 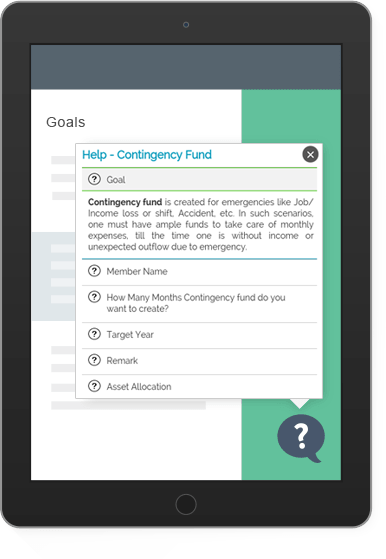 You have an option to decide on shortfall achievement thru periodic SIP’s or step up plans. 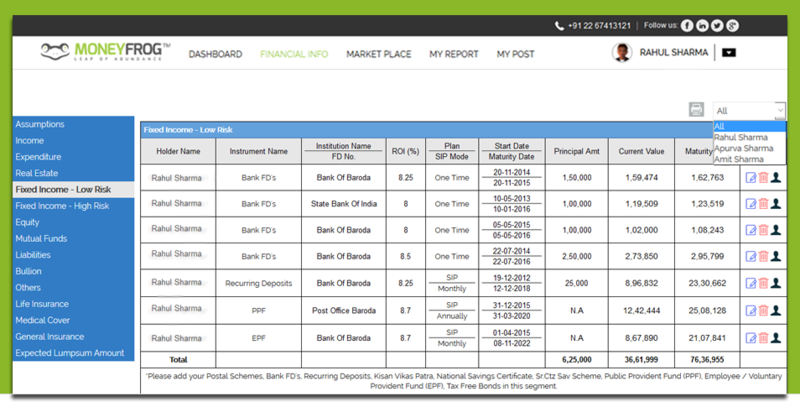 Track & monitor your Investments asset-wise, with live/ EOD data feed. This includes assumption towards inflation, asset wise returns & other parameters. Each asset class has multiple features & highlights to understand & track. Investments can be tracked member wise, as well as family wise. My report gives you a detailed analysis on your investments, cash flow, security, risk cover and goal tracking. This is a dynamic report and comes with quarterly reviews. You will be assisted by a CFP qualified advisor on explanation & recommendation thereafter. Market place keeps you updated with the new offers in the market and our recommendations. Market place connects you with manufactures of financial products. Thru market place one gets offerings on financial market, Real estate market & Lifestyle/ value add offers. We have the most comprehensive Mutual Fund analytics, tracking & execution services. 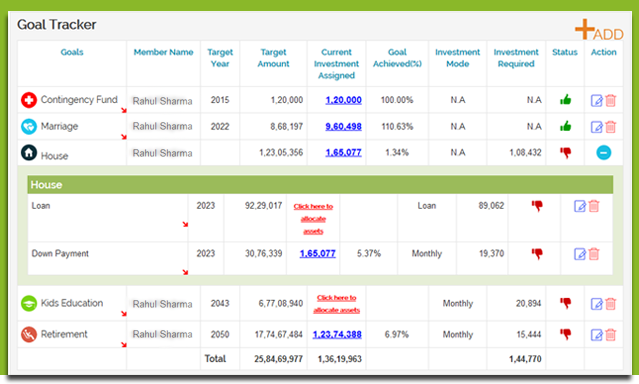 You can compare, filter & analyze schemes on various parameters, do a seamless purchase or redemption of schemes online.We have done a historic data integration, along with dividend calculation, such that you get all possible information on your schemes, past & present. DIY (do it yourself) customers will enjoy our portal & services, as we provide one of the best step by step guide on account usage (tour guide) and supported with comprehensive Help on each topic, terms or fields. Our Help is detailed, where we first explain the definition of the term, later explains same in layman's language & last, what we recommend. Along with same we have exhaustive FAQ's, which virtually covers all possible questions. Tax Filing: we provide Tax filing services, thru our CA network. All you need to do is upload your tax proofs as per your profile thru email & relax. 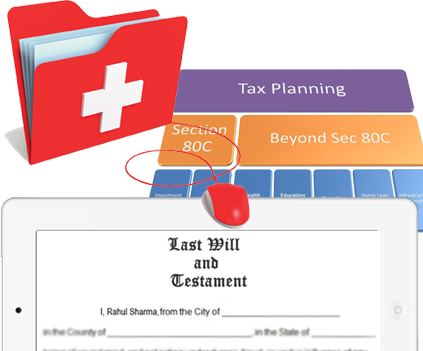 E-Will:E-Will helps you allocate your assets to your beneficiaries, as per legal framework.In case you require further assistance, same will be handled through our set of Legal advisors. EHR (electronic health records): Electronic health care brings all the old paper-and-film aspects of medical records and information – from X-ray images to your prescription history – into the digital world where it is easily received, stored and shared. That means a comprehensive electronic record of your medical history can be made readily available to doctors, specialists and other clinicians involved in your treatment and care.